From musical discovery (classical and beyond!) to consuming various other forms of arts and culture, to reading articles and books on virtually any topic under the sun, we’ll devour just about anything you send our way. So, it’s little surprise that we love infographics. It’s even less surprising that we love, LOVE seeing data visualized through and about music. What could be cooler than that?! 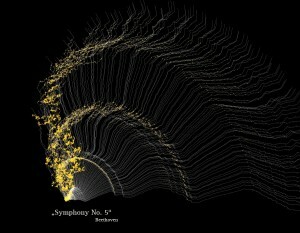 “Narrative 2.0 visualises music. The music was segmented in single channels. The channels are shown fanlike and the lines move from the center away with the time. The angle of the line changes according to the frequency of the channel, while the frequency reaching a high level, the channel becomes highlighted by orange. The visualisation should not necessarily return exact informations, even if the arrangement and uniformity of the music canbe read. The purpose was to create even more an aesthetically responding visualisation with the music as an artist.” More here. In addition to Estaban Diacono’s visualization of Olafur Arnalds’ music, the post features Stephen Malinowski and Michal Levy’s work. All great stuff! See the post here. This one is pretty self-explanatory! See the original post here. Polish audio-visual artist Bartek Szlachcic has created many visualizations, and Portrait of a Ghost Drummer is just one of them. See more of his work here. Do you have a favorite piece of musical data visualization? Please share! We’ll include it in a future post. It isn’t all the same! My dream is to tranlate music to colors… I am fan of these videos!